Warfare delivers huge levels of Arginine AKG, Beta-Alanine and Beetroot extract in its market leading blend which mixes easily with water and is available in a delicious range of flavours. For best results mix one to two scoops (5-10g) with 200-250ml of water 20-30 minutes before workouts. This product taken later in the evening can affect sleep. Arginine AKG, Beta Alanine, Cutrulline Malate, L-Arginine, Flavour, Beetroot extract, Caffeine, Panax Ginseng, Bioperine, Niacin (B3). 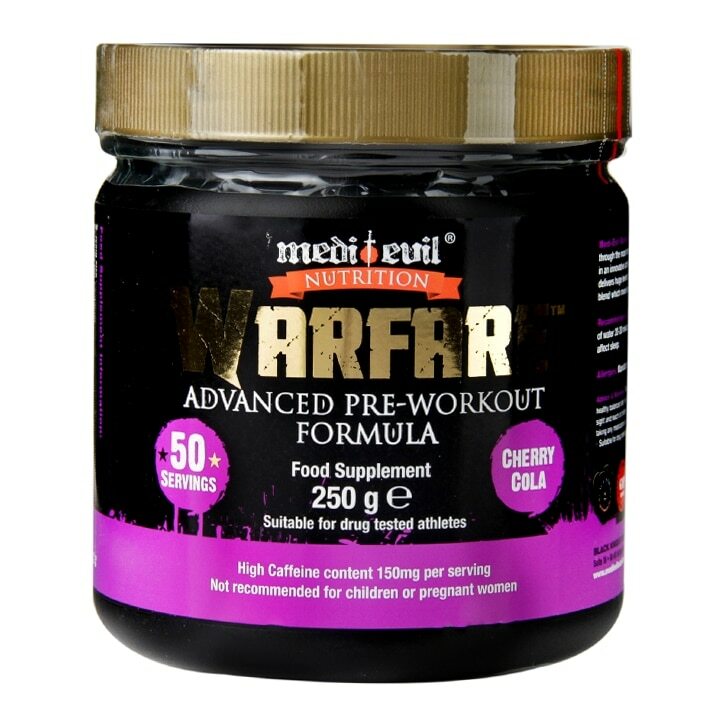 Medi-Evil Warfare Pre-Workout Cherry Cola is rated 5.0 out of 5 by 1.